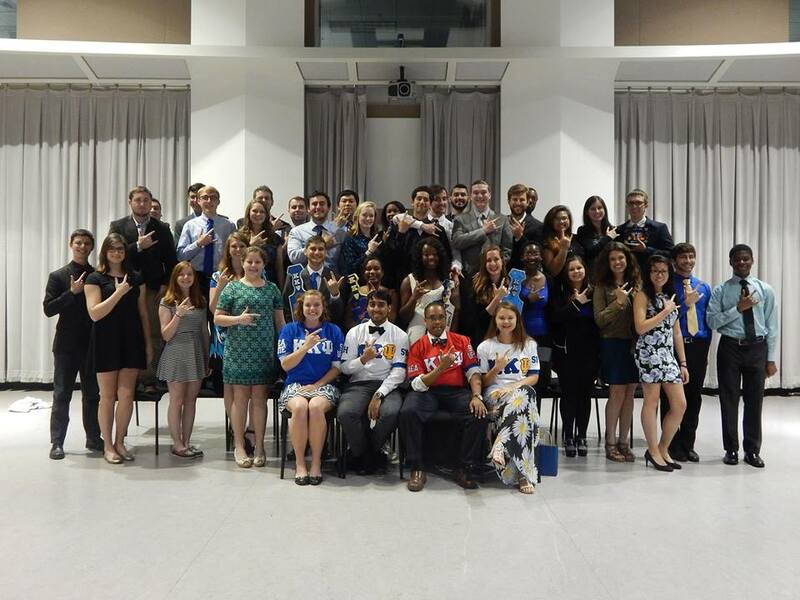 It’s the word that unites all of us in Kappa Kappa Psi. It’s what sets us apart from being merely a service club or a group of volunteers. Each brother has earned his or her membership in this brotherhood through hard work, dedication, and loyalty. But can any of us readily define what brotherhood really means? It’s certainly not a simple task to define something so intangible. In the word’s barest form, it simply means the condition of being a brother. The tricky part comes from defining what exactly it means to truly be a brother among your fellows in this fraternity. In fact, it’s proven so difficult to articulate that everyone seems to have his or her own definition of what it means. The Alpha Eta chapter takes brotherhood very seriously. As a part of our interview process, we encourage our candidates to ask each brother what his or her definition of brotherhood is. We hope to expose them to the many different definitions of brotherhood that are possible and to encourage them to come up with their own definition. In addition, there is another, more special occasion where our chapter attempts to explain to our candidates and to each other what brotherhood really is. My chapter has a tradition that not many know about. Each semester, in which we have a candidate class, we take part in what’s known as the Brotherhood Ceremony. During this ceremony, we share stories both funny and serious in an attempt to define what brotherhood means to us. We talk about occasions when we had a really good time with each other and experienced the more positive side of life together. But we also talk about the hard times, the occasions in our lives when we felt the saddest and the most alone, and how our brothers helped us when we needed it most. There are often tears during this ceremony, as could be expected when we talk about the worst things that have happened to us. Every one of us has been through our own dark times — the difference for us is that being a brother of Kappa Kappa Psi means we have someone to lean on. We have brothers who will always be there, no matter what, to pick us back up and set us on our feet. There will be always be someone who will stand next to us, wipe away our tears, and embrace us when we need it. For me, understanding this concept took a long time. I had been in an emotionally abusive relationship before coming to the University of Florida, and it continued until my junior year. When I first joined the fraternity, the idea of anyone but my blood-related family truly caring for me was completely foreign. I heard the stories of brotherhood and love around me, but it took a long time for them to really make sense to me. I knew that I cared for my brothers and knew that I would do whatever I could for them, but I honestly couldn’t imagine anyone doing the same for me. It wasn’t until a few of my brothers confronted me about my abusive relationship I realized it was possible they really did care about me. With their encouragement and love, I found the strength to finally put an end to the six-year relationship. It was one of the hardest things I’ve ever done, and I’m still dealing with the effects today. However, I now understand the love of my brothers is unconditional and unending. To me, brotherhood symbolizes love, acceptance, and the knowledge you aren’t alone. Being a brother means that you honestly and truly care for the people around you, and you are willing to help whenever it is needed. It means that you completely accept your fellow brothers for who they are, and you support them at all times. It means late nights, early mornings, and long afternoons spent listening to someone rant about anything — and even sometimes enjoying it. And, of course, it means working alongside your fellow brothers for long hours doing service for the bands and for music. This definition, however, is mine and mine alone. Every brother has a unique take on brotherhood, and each definition is just as real and valid as mine. We all have a story to tell; no two brothers are the same. We all have our own reasons for joining Kappa Kappa Psi, and, therefore, we have our own concepts of what we have gained from it. In the end, is there ever one way to succinctly and accurately define brotherhood? No, there isn’t. There is no single definition more correct than the others; we will always have differing ideas about what brotherhood really is. I believe that that is what makes brotherhood special — that a huge variety of people from different backgrounds and with different personalities can come together in one place for a single purpose. In this brotherhood, we have all committed ourselves to serving music and proved ourselves worthy of the love, respect, and support of our fellow brothers. We’ve earned the right to be called “brother,” and it unites us all in our bond of love and devotion. That is the closest we can ever truly come to defining brotherhood. Next story We March Once More, Brothers and Sisters!